How do you define science? Whose theories are right? And why are we as capable of achieving amazing feats of engineering and discovery as we are of believing in myths and legends? “Fascinating, highly informative and user-friendly.” Clare Calvet’s Weekend Reading, ABC. Tribal Science will take us through these unchartered territories of the murky world of scientific squabbles, arguments and accusations about who is right and who is wrong. In this book, I take a close look at the history of science in order to address the demarcation problem, dig into belief-formation to better understand our modern love and often blind faith in scientific culture, and propose how our tribal brains make it difficult to interpret the good science from the bad. 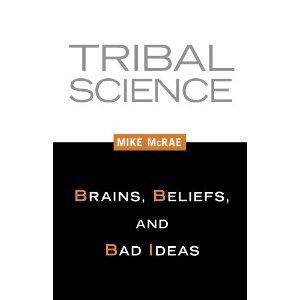 Tribal Science: Brains, beliefs and bad ideas is published by the University of Queensland Press (Australia) and Prometheus Books (United States and Canada). See Booko.com for a list of Australian retailers. Tribal Science is also available through Amazon.com and is on Kindle.